Egypt has objected to the storage capacity of Ethiopia's Grand Renaissance Dam, currently under construction, which it fears will negatively affect its Nile water share. Alaa Yassin, spokesperson on the Ethiopia dam issue for Egypt's irrigation ministry, called for decreasing the dam's capacity, currently set at 74 billion cubic metres, saying this will have an adverse effect on Egypt’s water supply. Yassin stated, according to state news agency MENA on Sunday, that his country's "studies" on the dam have shown that the capacity is "unjustified" and "technically unacceptable." In October, Ethiopia said it had completed 40 percent of the construction necessary for its $4.2 billion dam project, adding that the first stage of the dam will be operational from June 2015. 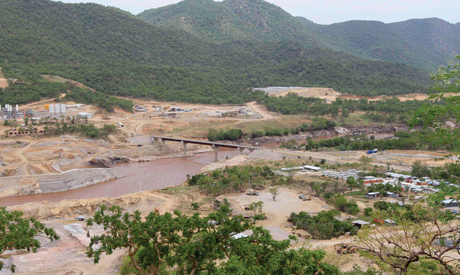 The 6,000 megawatt dam, set to be Africa's largest, is expected to be completed by 2017. Egypt, Ethiopia and Sudan have created a tripartite committee to conduct negotiations on the dam, a source of concern for Egypt. The committee is expected to meet mid-January to choose an international firm to conduct studies on the dam's impact. This meeting has been postponed twice while some firms have withdrawn from the pool of prospective candidates to conduct the study. In previous statements, Egyptian officials have said that there are several technical issues that could be discussed with Ethiopia should the anticipated report reveal that the dam will diminish Egypt’s water supply. Why you have a problem to see this issue from the other party prospective. If you are Ethiopian will you be okay for such request? Why you make every time something laughable to the news. Do you think your uncontrolled population growth s Ethiopia's problem. I always wonder how you are senseless. The electricity blackouts and gas shortage we are experiencing now would be nothing compared to water shortage if we reach 150 m people by 2050 as projected, we will have wars in the streets, not fighting terrorists, but each other for a bucket of water and a loaf of bread. This level of population growth is unacceptable. (1) Limit families to 1 child; there are many ways to implement it without fighting a religious battle, such as prohibitive taxation. (2) Plan a second source of drinking water using Concentrated Solar and desalination, which is now an affordable solution in desert climate. No matter what is the outcome of the DAM negotiation, population control is a MUST in Egypt. i always wonder how the Egyptian politicians are the so most inconsistent in their decisions. It becomes hard to believe them. I strongly advise the Ethiopian Government not to trust any thing that seams positive progress from them. Back to square one? "Egypt will likely need an additional 21 billion cubic metres of water per year by 2050, on top of its current 55 billion cubic metre quota, to meet the water needs of a projected population of 150 million, according to Egypt's National Planning Institute." Egypt is in a position to search the said amount of water either from Medit. Sea or from underground, and Egypt for sure could find too much water enough for the pop of Egypt & China. The GERD electric power will also make artificial rain for Cairo when the population reached that level! No comment on such perpetuated idiocy. Rejection and conflict don't solve the problem, Egypt must develop the ability to handle problem by peaceful means, we know most Egyptian accept Ethiopian right to use their water but there are some old regime Minister and corrupted officials want the chaos to divert the attention of the people and government.